The information, materials and content contained or available on the Site (collectively, “Content”) are protected by applicable copyright, trademark and other intellectual property law, and you may not copy, modify, use, disclose or provide access to any Content, except as expressly authorized in these Terms, without the prior written consent of GCG. The Content is provided solely for general informational purposes and solely for your personal, authorized use. GCG may make changes to the Content at any time without notice. GCG does not, however, make any commitment to update the Content. The Content is provided “as is” and GCG hereby disclaims all warranties, expressed or implied, including without limitation any implied warranties of merchantability, fitness for a particular purpose, or non-infringement of intellectual property or other violation of rights. Further, GCG does not warrant or make any representations concerning the accuracy, completeness, currency, availability, quality, usefulness, or reliability of any Content or any use thereof or otherwise related to the Site. In no event shall GCG, its affiliates or its or their respective directors, members, officers, employees, agents, representatives, suppliers, service providers, partners or licensors be liable for any incidental, consequential or other damages (including, without limitation, damages for loss of data or profit, or due to business interruption) arising out of or related to the Site or the use or inability to use any Content, even if advised of the possibility of such damages. Some jurisdictions do not allow certain limitations on warranties or liabilities, and these limitations may not or may only partially apply to you. Eligibility. GCG users can sign up on the Site to participate in the Granny Rewards program, although we reserve the right to limit participation in our sole discretion. Earning Cash Back. You may earn cash back through certain activities when you interact with GCG or applicable Partners. Additional information about how to earn cash back is available at https://www.giftcardgranny.com/rewards-program/. Cash Back Balance. Each time you earn cash back, we will update your cash back balance, which you can view by logging into your account. If we post cash back to your account for any activity that is, in our reasonable discretion, ineligible or subsequently voided or cancelled, we will remove that cash back value from your account. If you believe that you have validly earned cash back that have not been posted to your account, please contact us or visit the customer support portion of the Site. Redemption. 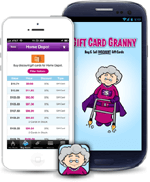 The cash back you earn may be redeemed only for select merchant gift cards offered by Gift Card Granny. Redemption option availability and options are subject to change. We reserve the right, in our reasonable discretion, to deduct a cash back value from your balance upon the redemption of such cash back in connection with the Granny Rewards program. Once a cash back value has been deducted from your cash back balance, it are not subject to any refund, credit or other adjustment, regardless of whether any underlying transaction is ineligible, cancelled or otherwise void. Restrictions. Cash back cannot be purchased, resold, transferred, redeemed directly for cash or applied to any other account or user. Your cash back may not be used together with any other rewards, points, special offers or discounts. We may limit the amount of cash back you can earn or use within certain periods of time or implement other restrictions on the receipt or use of cash back. You acknowledge and agree that cash back may be redeemed solely by eligible available Redemption options and that cash back do not constitute the property of any user. Expiration. Unless we expressly state in writing otherwise, cash back automatically expires twelve months following the date when such cash back was earned or otherwise received. Changes. We may change, suspend or terminate the Granny Rewards program, in whole or in part, at any time and in our sole discretion. If we decide to terminate the Granny Rewards program, we will post a notification on the Site or otherwise provide notice of such termination. Upon termination of the Granny Rewards program, cash back earned but not used will automatically expire. Termination. We reserve the right to suspend or terminate your participation in the Granny Rewards program and/or your access to the cash back in your account, if you violate these Terms. We may also suspend, cancel or otherwise limit your access to cash back if we suspect fraudulent, abusive or unlawful activity associated with your account. If we determine you fraudulently obtained cash back or used fraudulently-obtained cash back, we may revoke that cash back value and suspend or terminate your account. Taxes. It is your responsibility for determining if you may be liable for any federal, state, local or other taxes as a result of earning or using any cash back. The Content could include technical, typographical, or photographic errors. GCG reserves the right to cancel any transactions or deduct any cash back that relate to any such errors. You consent to receive communications from GCG electronically. You agree that all agreements, notices, disclosures, updates and other communications provided to you electronically satisfy any legal requirement that such communications be in writing. You shall provide truthful, accurate and complete account information, and you must keep your contact information up-to-date. You acknowledge that by providing access to any user-submitted Content on the Site, GCG is merely acting as a passive conduit for such distribution and is not undertaking any obligation or liability related thereto. GCG reserves the right, in its sole discretion, to block or remove any Content. Harassment in any manner or form on the Site is strictly prohibited. You shall not impersonate others, including any GCG employee or representative. You shall not post or otherwise distribute any content on or through the Site that is libelous, defamatory, infringing, obscene, threatening, in violation of any privacy or other rights, illegal or otherwise objectionable. You agree to indemnify, hold harmless and, at our option, defend GCG, its affiliates and its and their respective directors, members, officers, employees, agents and partners from and against any and all claims, proceedings, liabilities, damages, settlements, losses and expenses (including reasonable attorneys’ fees and expenses) arising from or related to any violation of these Terms or any activity related to your account. The Site may link to websites operated by third parties. Even if such third party is affiliated with GCG, we have no control over these linked sites, all of which have separate, independent terms and privacy practices. These linked sites are only for your convenience and you access them at your own risk. GCG disclaims all warranties related to such sites or any products or services offered in connection therewith. These Terms, and any claim relating to the Site, shall be governed by the laws of the Commonwealth of Pennsylvania without regard to its conflict of law provisions. The courts of general jurisdiction located within Allegheny County, Pennsylvania will have exclusive jurisdiction over any and all disputes arising out of or related to these Terms or the Site. GCG may assign or delegate these Terms, in whole or in part, to any person at any time and without notice. You may not assign or delegate these Terms, or any rights or obligations hereunder, without GCG’s prior written consent (which consent may be withheld in GCG’s sole discretion), and any purported assignment in contravention of the foregoing shall be null and void. If any provision of these Terms is held invalid or unenforceable by a court or government entity of competent jurisdiction, such provision shall be enforced to the full extent permissible under applicable law and the other provisions shall remain in full force and effect.